For many people at this time of the year it’s busy, crazy, hectic and some of you are on your last nerves. You want to yell and scream but you’re trying not to slide down that slippery slope to yelling obscenities. ‘Tis the season, after all. What to do…what to do. 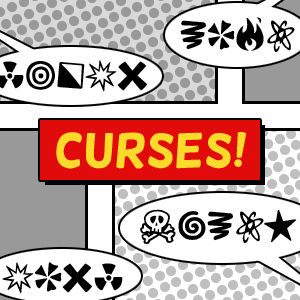 Although cursing can be good for us at times, it’s not always appropriate or necessary. One option is to refer to The Shakespearean Insult Kit and have and have a few insults at the ready. We’ve all encountered at one time or another a churlish, motley-minded fustilarian, have we not? 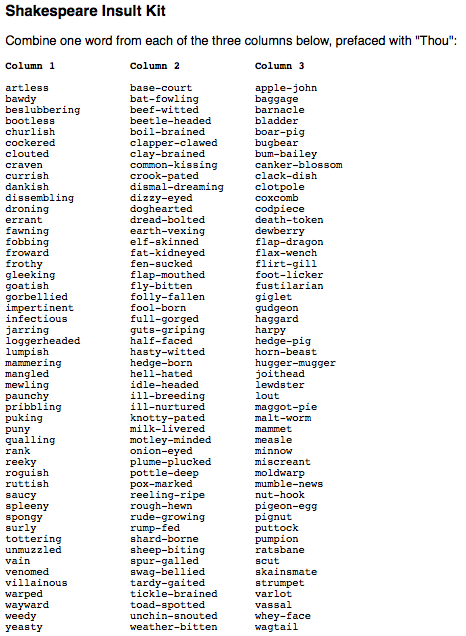 The Shakespeare Insult Kit is a list of words that English teachers are passing along to their students so that the young ones aren’t always cursing, can be more creative in their insults and learn that Shakespeare can also be fun. So, take a few moments to review the list and when you need it most, you will have an insult ready to go without using offensive language.